In 2014, Kearsarge House owners Elaine and Michael Morgillo began testing interest in opening the York Beach Residence Club, the Short Sands Beach landmark, prior to renovating the 1898 structure. The vision was ambitious: develop an affordable higher-end option for people to enjoy the beauties of York Beach without having to spend half a million. They loved the concept of allowing visitors to be able to spend more than just the summer in York. The vision benefited potential owners, guests, and the community. Next came the work. The beginning of 2017 marked the grand opening of the York Beach Residence Club and Luxury Resort. 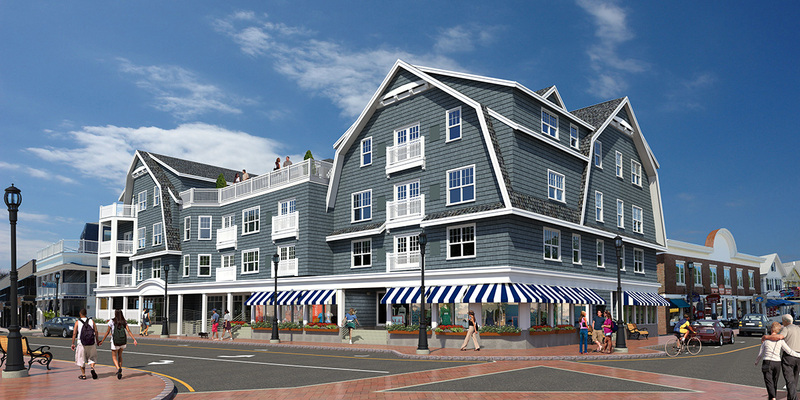 The final design honors the iconic Kearsarge House and enhances the community of York Beach, Maine. Owners and guests are literally just footsteps away from the beach. Reservation inquiries and ownership continues to increase. The York Beach Residence Club will sell its remaining units, and then it will focus on resort reservations and club owner experience. Contact us now to reserve a room or to learn more about ownership. All rooms are equipped with high-end fixtures, furniture, appliances, and hardware. You work hard, so we took care of the details. Our goal was to provide our owners and guests an opportunity to enjoy the beauty of York Beach, Maine in style. By the end of 2016, York Beach Residence Club’s beauty and charm was evident. Prior to opening, all three of the retail spaces were sold including the one restaurant space. People noticing the potential and luxury jumped on the opportunity to become an owner. Eighty percent of all the fractional share condominiums were sold. The Morgillos’ goal of changing the tenor of York Beach to more of a year-round community appeared to be coming to fruition. All of our rooms are equipped with high speed wireless internet. In the busy beach town of York Beach, we provide a free parking space in our private parking lot. Cardio machines and weights are available to sneak in a workout while on vacation. Our popular units come with fully equipped kitchens and spacious dining areas. A private ocean view roof deck exclusive to guests overlooks the beauty of Short Sands Beach. Our resort has a washer and dryer conveniently located for guests. All year round, enjoy our heated indoor saltwater pool and hot tub. Enjoyable the glow and warmth of a fireplace while curled up on a plush sofa. York Beach Residence Club has spacious luxury rooms each designed to fit your specific needs. Newly constructed in 2017, our resort takes York Beach to a new level. A couple retreat, family vacation, special event, or experience luxury living we are designed for the best. Located in the very heart of York Beach Maine, you are footsteps away from the beach. We have rooms configured to sleep groups from 4 to 10. No reason to book 4 separate rooms for your family, when you can book one. Tour our luxury accommodations and book today! As a Mainer, we are proud of our seafood with York Beach has many options. Beyond lobster our beach town offers culture, including our favorite restaurant 1652 Italian restaurant located on the main floor of the resort. The most popular Maine coast attraction on the planet, Nubble Lighthouse located on the point of Cape Neddick, is a 1.3 mile journey from the resort. We recommend walking. Start on a beach walk on Short Sands, and then a walk along the coast. Do not forget your camera, fishing pole, and food for a picnic. For an adventure, you can join a group to go scuba diving for treasure along the lighthouse. Take a short road trip up the coast, experiencing all the charm of the local townships: Ogunquit, Wells, Kennebunkport, Saco, Old Orchard Beach, Cape Elizabeth, and spend the day in Portland, Maine. Want to see leaves change colors in the fall, a drive near Moosehead Lake is amazing. Go on a ghost adventure in York Beach. Do not limit yourself. Maine is one large natural theme park for families. The people in Maine no how to relax. Life is better on the beach. The resort’s prime location in downtown York Beach gives you a lot of options per your preference. Speak to our local staff at the front desk for a tailored recommendation. In our sister town, we host an award winning legendary theater in Maine called the Ogunquit Playhouse. Located at 10 Main Street in Ogunquit, Maine, the Playhouse shows wonderful musicals, plays, and productions that will leave you in awe. A few years back, the people on the Southern Maine Coast invested a lot of resources on expansive bike trails traversing the coast, estuaries, woods, and through small townships. Mount Agamenticus is only a few miles inland and is a great place for hiking, horseback riding, and enjoying the woodland beauty of Southern Maine. Experience the water. Canoe or raft inland on the Saco river. On the ocean, the options are limitless. All in York, Maine learn to sail, go on a whale watch, lobster hunt, deep sea fishing, rent a kayak, surf, or simply sun bath. Build a lasting memory with the family on partake an adventure exploring the Legend of Boon Island – cannibalism, haunting, survival, and so much Maine fun. The islands and the coast off the coast of York Beach will instill a love for the ocean that you will miss the smell of that salty cool sea. Check-in is at 4:00 PM on the day of your scheduled arrival. At Check-In you will be provided with a key card to access your room, building amenities and the parking lot. Contact the front desk if you are unable to arrive for check-in during front desk operating hours. Check-Out is 11:00 AM the morning of your scheduled departure. All cancellations are subject to a $50.00 cancellation fee. If cancellation occurs more than 30 days prior to arrival, the deposit amount will be returned, minus the $50 cancellation fee. If a cancellation occurs within 30 days of arrival, the deposit will be forfeited. The deposit amount applies to your last scheduled night of stay. Guests must be at least 21 years of age to make a reservation and will be required to show photo identification at check-in. All occupants must be at least 18 years of age unless accompanied by a parent or legal guardian. The entire building and property are non-smoking. Anyone found in violation of this policy will be charged a $500 fee. Secure your reservation and start making memories on the coast of Southern Maine. Book a room online or contact us directly to speak with one of our local experts to plan your next vacation.